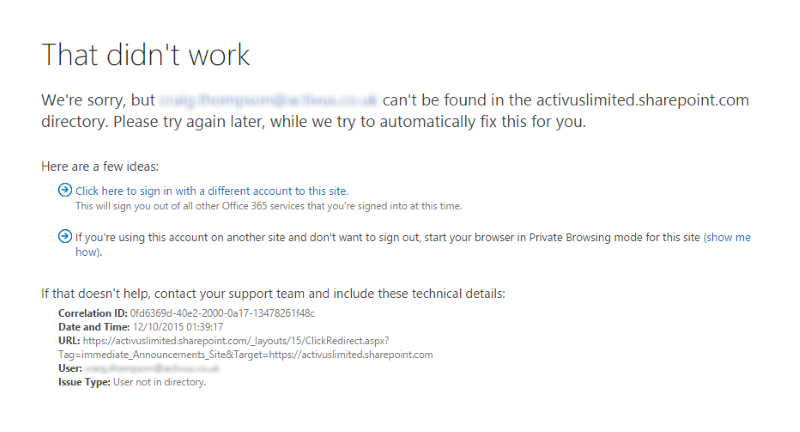 Weird glitch with Office 365 when a user who had returned from a two week long holiday tried to access a document in Sharepoint Online. The error message shows that the user is not in directory, which is incorrect. He couldn’t login to Microsoft Office 365 at all, however Outlook still worked and he could send and receive email. Resetting his password fixed the problem. But what was the underlying cause could not be discerned. It wasn’t that he was logged in using his MSDN Microsoft account which has the same email address and therefore the same username as his Office 365 organizational account. A Private Browser session was tried and that failed. Also attempting to login from a completely different Pc failed in the same way. 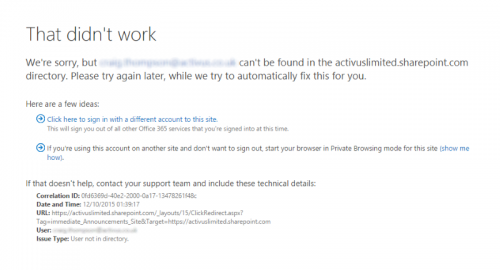 My best guess is that the Azure Active Directory object associated with his account had been locked due to an expired password or the object had become corrupted in some way. Resetting the password then updated the object’s attributes which allowed the account to become active again.